If you are wondering what to do with your garden zucchini, try these Zucchini Chocolate Cupcakes. And if you don’t have any zucchini, I am sure a friend or neighbor would be happy to share with you:) I am going to have to hunt down some more zucchini so I can make these cupcakes again. They are a new favorite! Check out our other favorite zucchini recipes here! You will want to make them all! The BEST chocolate cupcakes! You will never know they are made with zucchini! Pre-heat oven to 350 degrees F. Line two muffin pans with paper liners and set aside. In a medium bowl, mix together the brown sugar, butter, and oil. Beat in eggs, one at a time until well incorporated. Stir in vanilla extract, buttermilk, zucchini, and chocolate chips. In a separate large bowl, mix together all of the dry ingredients. Add the liquid ingredients and mix until well combined. Spoon batter into large muffin pans, filling them about 3/4 the way full. Bake in the center of the oven for about 30-35 minutes, or until a toothpick comes out clean. Cool cupcakes on a wire rack, while you make the frosting. To make the frosting, melt the butter. Whisk in the cocoa powder, whisking until smooth. Alternately add powdered sugar and milk, beating to spreading consistency. Add small amount additional milk, if needed. Stir in vanilla. Frost the cupcakes with the chocolate frosting. Decorate with sprinkles, if desired. Store cupcakes at room temperature in an air tight container. * Note-the frosting makes about 2 cups, you might have a little extra. I love this idea- I always think of making zucchini bread, but not “treats” like cupcakes and brownies! I have a long standing phobia of zucchini but maybe these cupcakes will help me get over it! They look absolutely delicious. Maria these are awesome looking. 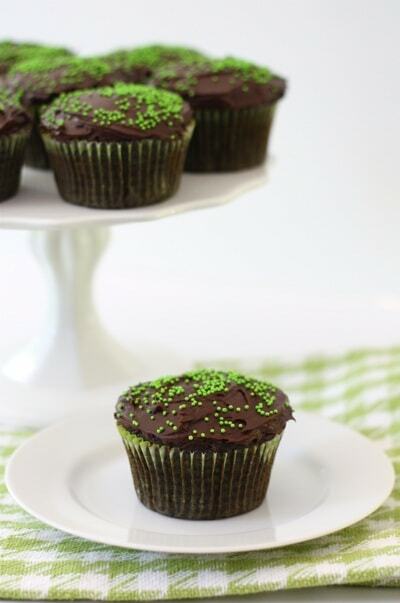 The neon green sprinkles against that chocolate frosting is just beautiful! Zucchini would make these cupcakes moist and delicious, of this I have no doubt! Fantastic looking cupcakes! I love adding veggies to my baking! I love the green sprinkles! 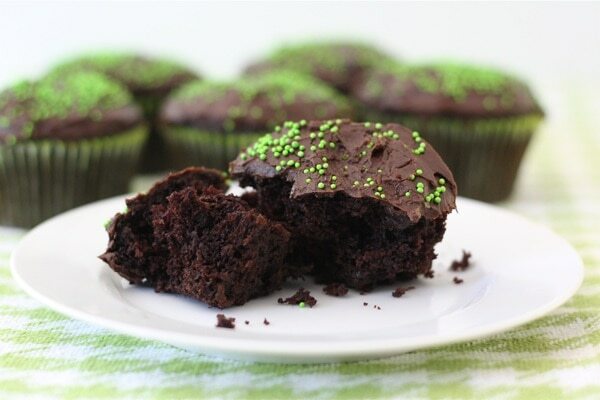 these look so perfect for st. patrick’s day…and i love the combination of zucchini and chocolate! The green sprinkles on top are so fun. A perfect way to use zucchini. oooo lala these look decadent! PERFECT idea! And the colors are so nice, too! I need like 14 of these, right now, in my head. 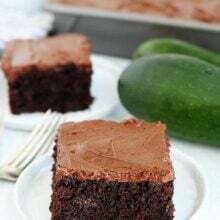 chocolate and zucchini is such a great combo! Hope you had a great weekend! Finally a cake recipe using courgettes that looks appetising! 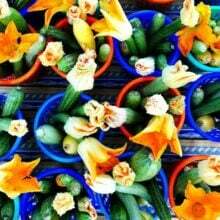 We’ve got a glut of courgettes too, and I tried courgette muffins and not even my husband (hoover) would eat them! We didn’t plant a garden this year, so I’m not overburdened with zucchini like usual, but this makes me wish that I had lots of it right now! What a great idea. Love the idea of eating veggies too whenever possible. Your picture of these cupcakes is so cute…the green sprinkles are perfect for zucchini. These look fantastic and I love that you topped them with green sprinkles! I love zucchini, and zucchini cupcakes, well, that’s a no brainer! Um, I’m sorta loving the cute little green sprinkles too 😉 You’re gonna be such a great mom, kids and sprinkles = great combo! I have zucchini in my refrigerator and I’m not afraid to use it….especially with chocolate. 😉 Yum! The little green sprinkles make these so extra fabulous!!! chocolate and zucchini is such a winning combo. these are adorable, Maria!!!! Looks so moist! Love the green sprinkles! Maria, those green sprinkles on top are wonderful! I’ve been thinking about making chocolate cake with our zucchini, but I like your idea of cupcakes better. I love sneaking veggies into baked goods…especially when it involves coercing my brother into eating veggies he THINKS he doesn’t like! These look fabulous. 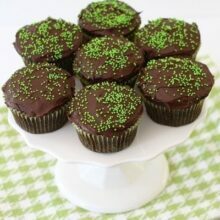 I am just in love with the deepness of the chocolate and the green sprinkles on top. Makes me want to eat the whole batch. 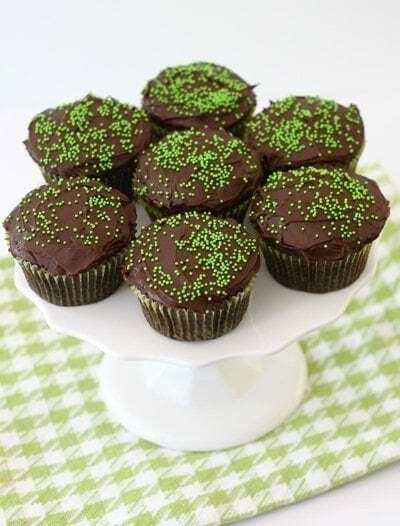 What a terrific way to use up all the zucchini that’s overflowing this time of year – would never think to pair chocolate with zucchini in a cupcake, but why not! I love zucchini bread and muffins, so moist. I love chocolate and zucchini together! I think the green sprinkles are an adorable nod to the zucchini! Our recipe uses ground cloves too — and it’s delicious! I love the buttercream frosting, although I am partial to our whipped cream frosting. I tinted it a light pink color and served our chocolate chip zucchini cake as cupcakes for a little girl baby shower 🙂 No one knew there was a veggie in there! Love this trick of adding vegetables to sweet treats … and yes, it will be our little secret!! I just made a chocolate zucchini cake yesterday! It would be fun to make cupcakes sometime. Love the little green sprinkles. would have never thought to put zucchini in a cupcake but these sure do look good! I always have difficulty baking with Zucchini… How finely do I grate it??? I used a cheese grater-it was a “medium” grate. I didn’t bother peeling the zucchini either. I hope this helps! I never would’ve thought to use zucchini in a chocolate cupcake – I love it, Maria! They must be super moist. We will be celebrating a 90th bday and this will make an excellent bday cake for the celebration! These are so cute. Thanks for the great recipe! Love the sprinkles on these, so cute 🙂 Zucchini in baked goods is perfect, you can hardly taste it yet it’s there and making it slightly more acceptable to eat tons of chocolate! Yum, anything that includes Zucchini AND chocolate steals my heart! Oooh! Health food! How fabulous… Can’t wait to make them and feel self-righteous. I want these asap!! They look cute and so delicious. We too have some beasts of zucchini growing in the veggie patch at the momento, but i have never eaten a baked good with them in! crazy i know. This summer this simply must be changed, and as you say you really cant go wrong with a choccy cupcake 🙂 great recipe thanks! I so cannot believe that this will work, but since I stumbled across your blog lately I have read so many wonderful, mouth-watering recipes that I trust you with those, too! I can’t wait to try this out! I have been wanting to try some zucchini dessert recipe for so long! Your cup cakes look so rich and delicious!! Made these after you posted the recipe and came out great!!! My zucchini didn’t grate the way I wanted it to but it didn’t affect the recipe or taste at all – will link to you guys when I post on my blog – thanks for another great treat!! Yes indeed, the zucchini are out in full force and these cupcakes sound like a great way to start chipping away at the seemingly never-ending supply. Beautiful decoration hint at the goodness within! Love it! Hope your pregnancy is going as well as mine is! Six weeks to go! Glad you liked the spread-it is addicting:) Best of luck with the rest of your pregnancy! These are so cute! I hate a huge zucchini from my garden that I’ve been wondering what to do with…this is a fantastic idea! you are just amazing! ALL your food and desserts look so so good! I’ll have to add this one to the list as well! I agree with zucchini overload! We made a yummy garden chili tonight, with of course zucchini! Such a good way to hide vegetables in a treat! i am not a gardener. i should be with the almost 2 acres of land we have, but cannot get into it. I had chocolate and zucchini bread the other day, but THIS looks even tastier! I actually used up all my zucchini…I wish I had some now! I’m going to add this to my list of zucchini recipes to bake this summer! Yum! 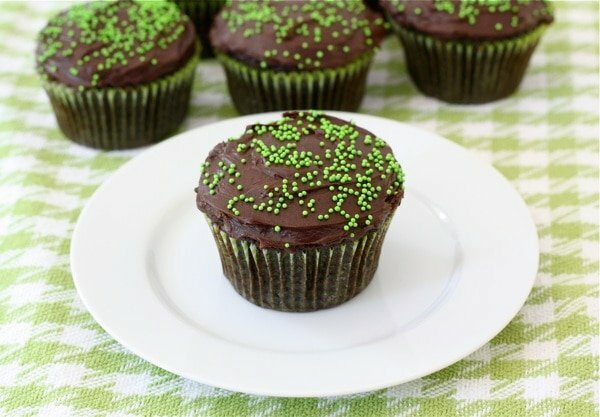 Oh my, I haven’t had the chocolate/zucchini combo in forever — these cupcakes must be insanely delicious!! I’ve always wanted to try this combination. Thanks for the recipe! (I found you through Todays Creative Blog.) Cheers! These look and sound so wonderful Maria!!! I am totally digging the green decorations! Wow! Never thought of adding zucchini to my cupcake recipe! Thank you for sharing this wonderful recipe! These are awesome! Very moist and tasty! No one knew they had zucchini in them, I even used the green sprinkles for presentation! 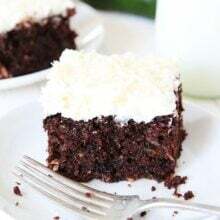 I’ve made chocolate zucchini cake before and we love it. I love how you put the green sprinkles as a touch back to the green zucchini. So adorable. I made these cupcakes last night, while my husband was out and my boys were alseep. If they knew there was zucchini in these I think they would run. I was a little freaked out at the whole zucchini chocolate idea when I first read this post, but I love your other recipes and thought I’d give these a try. I’ll sneek veggies in where ever I can to feel less guilty. These cupcakes are SO good! They are rich and puffed up beautifully and made me very happy. The cinnamon smell in my house was wonderful. Thank you for this recipe! You are very welcome! Glad you liked the cupcakes! 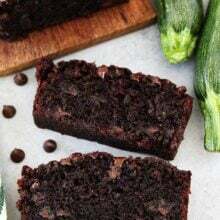 My chocolate zucchini cake recipe doesn’t use as much zucchini as yours. I’ll have to give it a try. Pingback: Breakfast Cupcakes: Chocolate Zucchini! These look delicious! What do you recommend though if I don’t want to use eggs? I know there are many possible substitutes, but I’m not sure which is best. Zucchinis are a great match for chocolate…and it adds beautiful moisture to the cupcakes. This might be a silly question, but since I’ve never baked with zucchini before…… When you shred it, do you leave the skin on?? I used this recipe to make cupcakes for my son’s school birthday treat. The only change I made was substitute 2/3’s of the oil with applesauce and I halved the frosting recipe. These were so delicious and I am definitely keeping this recipe in my rotation! Thank you for posting all those years ago! Have you tried making this recipe into a layered cake? I’m wondering about the baking time for 2 round cakes. These sound delicious, and I will be making them when zucchini are in season here. Just one small piece of feedback – Plurals (friends, kids) don’t need an apostrophe.